If you've always wanted to see a cargo bike race like the ones held in Copenhagen here is the U.S., now is your chance. They only catch is you need to be in Sacramento, Ca. this weekend. Sounds like it will great fun had by all. We bring you some post race interview if we can get these folks to slow down long enough. What: We race with 50lbs of Compost to bring to the farm. Then we pick and load pumpkins and race to Bike Dog Brewing. There is no cost, and this is about fun and fun only!! Of course we'll scrounge up some prizes and possibly some cool trophies! All ages, abilities and styles of bikes are welcome! Route is up to you, we all leave at once with 50lbs of Cargo. If you have a kid on board we can't do much to offset time, but if it's close we'll consider the advantage/disadvantages that exist. There will be a clear winner of Heat 1. Final Call if tie or other "complaints" will be called by a 3 judge panel and you'll be ordered to smile and cheer at the decision. There will be a 30 second penalty for any traffic violations seen by judges (no I won't tell you who the judges are, they are probably racing). You will pick and load a minimum of 50lbs of pumpkins (pumpkins are typically 7-10lbs each) For every pound under 50 you will have a minute of time added to your racetime and alternatively for every 10 pounds over we will remove a minute (keep in mind the time it takes to pick and load) We will all take the same route to Bike Dog (to be shared later). There will be a clear winner of Heat 2. Final Call if tie or other "complaints" will be called by a 3 judge panel and you'll be ordered to smile and cheer at the decision. 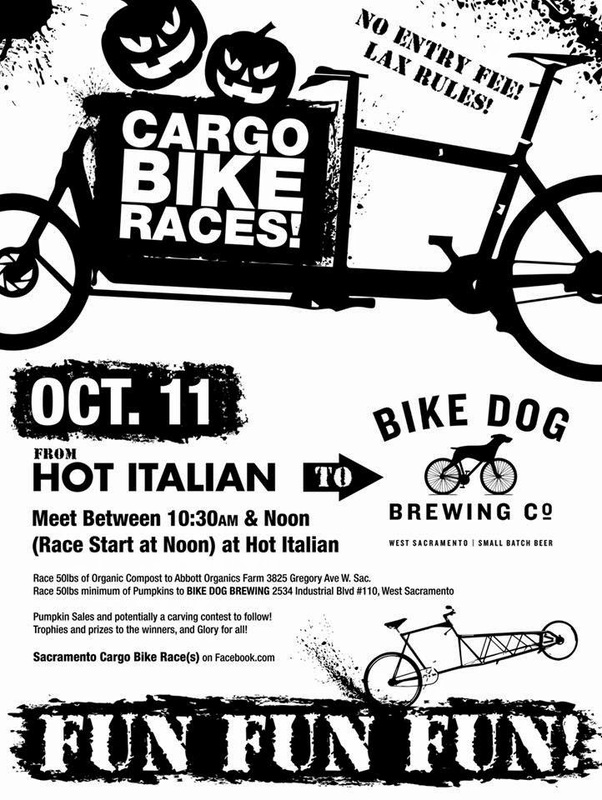 Bike Dog: Let's get some kids to carve some pumpkins, let's eat, drink, and smile about Cargo Bikes, Sacramento/West Sacramento and how awesome we all are!! Wanna Volunteer to help........please do, I need it!! Would you like participate in cargo bike races in your home town?